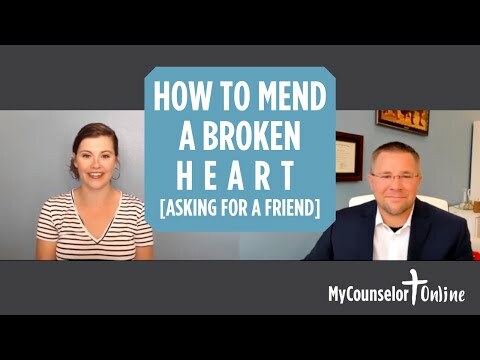 Will a broken heart be mended again? If so, how? Welcome to my counselor online. I’m Kathy and this is asking for a friend that’s where you submit your questions and I tracked down one of our therapists to answer them. So today’s question comes from and in Uganda. And her question is, will have broken heart be mended again if yes, how and today to answer and question. We have one of our therapists Josh for life. So, Josh, thanks for being here and thanks for answering his question. Well, first let me say to and I’m sorry you’ve got a broken heart that’s a hard thing in life and and deal with loss of somebody that you care about, or a situation that just kind of leaves you in feeling discouraged feeling hopeless feeling unsure about the future. And I just want you to know that you are going to be able to get through this that Broken Heart as an unpleasant thing to experience. But most people experience it at some juncture in the course of their lifetime. And we generally will get through them so that the short answer your question is yes broken heart can heal and let’s talk about how to go about doing that. There’s a sane. That is absolutely untrue, though. It’s very common that is time heals all wounds and that’s just not the case. And that, that in fact some wounds with time just fester and get worse. However, if you learn how to take care of your heart. How to grieve the loss that you’ve experience time passing will bring healing to that. And so the steps for that are what we call a grief process re process is about identifying the losses that are part of your situation. Sometimes that’s very apparent terms of maybe a person that no longer is in your life or someone it no longer wants to be in your life. And so there’s that. Loss of that individual. But there’s also other losses that are a part of a loss like that loss of companionship, loss of somebody to do something with in your free time a loss of that. For most support somebody to turn to and share what you’ve got going on on a day to day basis, loss of some money to dream about the future. And there’s all these different losses that are a part of a broken heart. And so one of the common tools that we use in identifying losses and working through the pain of those Is just letter writing home grief letters and we use a notepad and pen and we we ride out letters to the person whom the grief is associated with And we identified rap words around the things that we’re feeling all the different losses that are part of that. And that’s painful and it’s uncomfortable and it’s difficult to do, and generally want to just avoid that. As we do with most things that her right if you get an entry on your arm. You don’t want to touch it, you know, on you want to kind of covered up and stay away from it. Not explore it not figure out what’s going on there. And yet, if you don’t, it won’t peel. It’ll just stay this sore festering kind of spot in your heart. And so one simple tool that you can use to help identify the losses that are part of the heartbreak. And to begin mending and healing in that is to due process journaling grief letters. Or you write letters and these aren’t ones that you’re going to deliver to or gift. The person or or even be able to give to the person if they’re no longer alive or you no longer have them in your life. That but instead they’re for you to be able to wrap words around in a sort through the mixed emotions that are part of your situation. In a way that enable you to move through that grief and all the different mixed emotions that are part of that and make it through to the other side of that. That sounds like a really powerful helpful tool to process that grief that’s happenin Due to that loss. So thank you for sharing that tool with us, Josh. Thank you for your time. And thank you, and for submitting your questions. Are going to post on our Asking for a friend page and also in an upcoming edition of our weekly e newsletter. So check for them there.